When summer ends, salads become heartier and more flavourful. 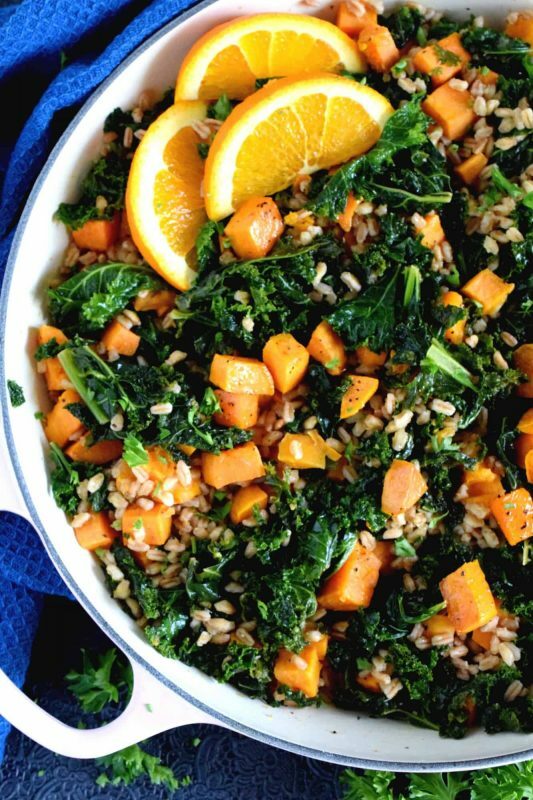 This warm Kale and Sweet Potato Farro Salad is dressed in a light orange and ginger glaze; it’s super high in protein, and delicious too! My Dear Reader, if you have never tried roasted vegetables in a salad, I implore you to do so immediately. 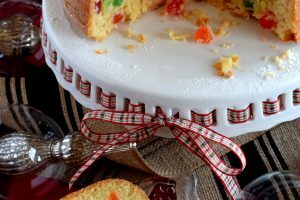 Put away your computer or your phone – whatever device you are using to read this post – and run to your kitchen. Preheat your oven and dice up some butternut squash, sweet potatoes, turnips, or even Brussels sprouts. All of these vegetables, when roasted, add so much flavour and texture to a salad. You gotta trust me one this, because I am not one to promote salads! I have often piled roasted veggies onto a bed of chopped and washed lettuce, drizzled over a little bit of olive oil whisked with honey or maple syrup, and called it dinner. I almost always use romaine. I’m not a huge fan of those lettuce mixes, and romaine is crunchy and hearty enough to hold up to the weight and flavours of roasted veggies. 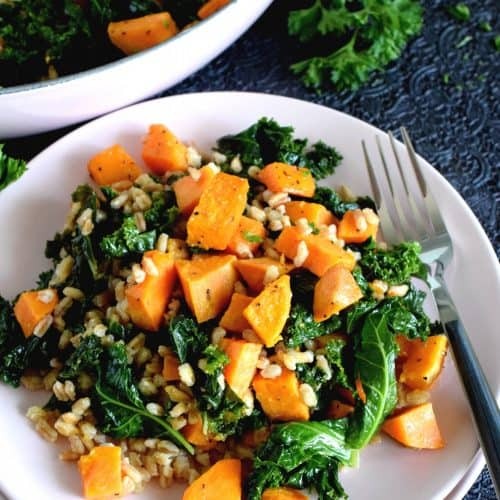 Look at this salad – you’ve got the roasted sweet potatoes, which have been added to the wilted kale, and tossed with a woody, tasty grain like farro. 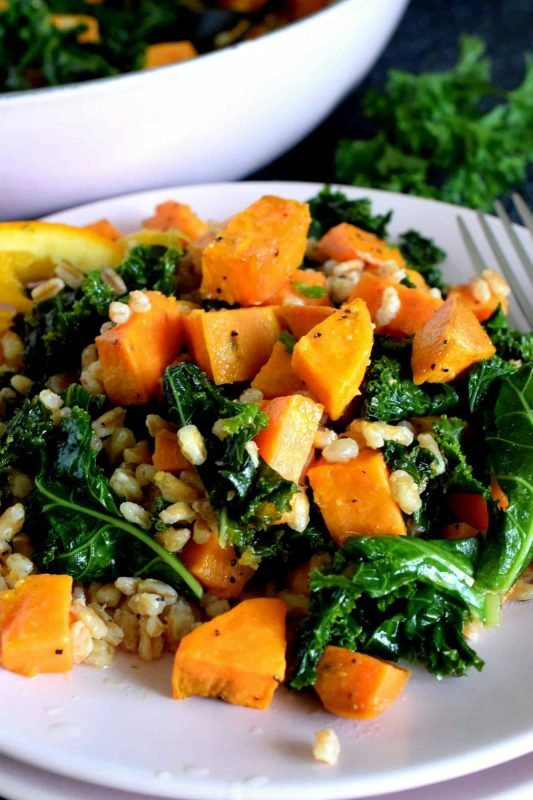 Farro is a whole grain, much like other whole grains such as barley and quinoa. 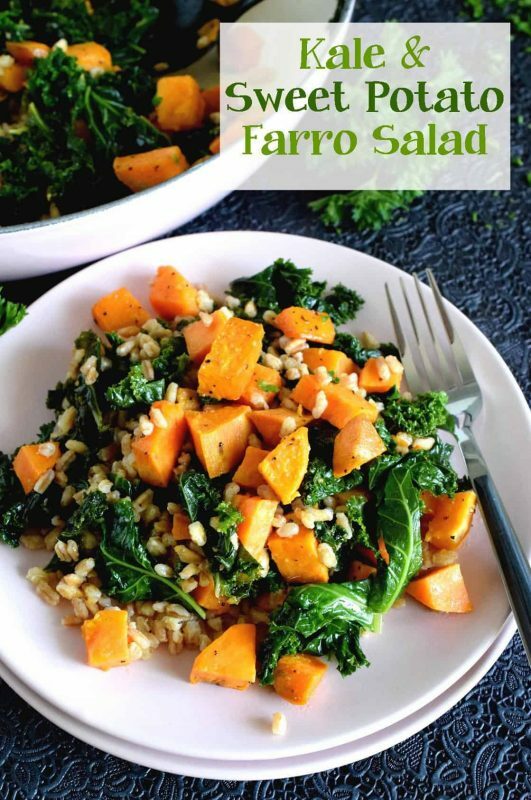 Farro looks quite a bit like a larger grain of barley and has a similar taste and texture. 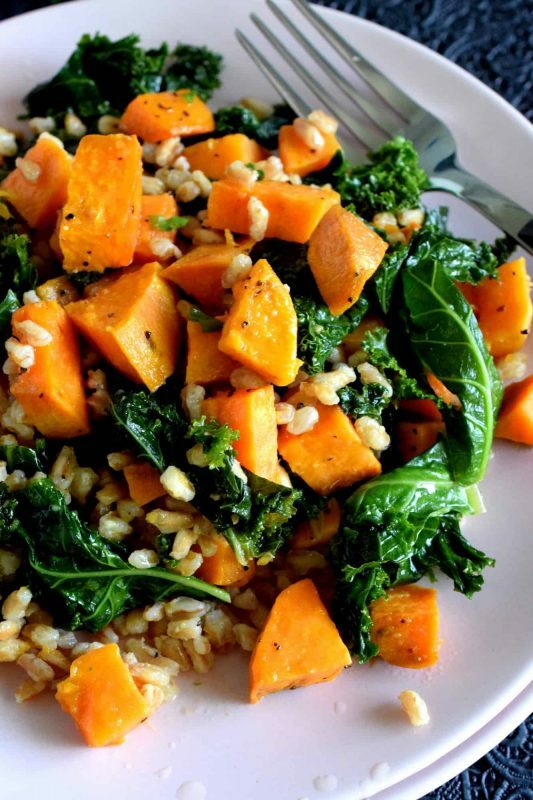 Like barley, farro is still a bit chewy when cooked, rather than soft and mushy. If you like the chewy texture of barley, you will also like farro, but if you’re used to eating rice, you may find the texture a bit odd. 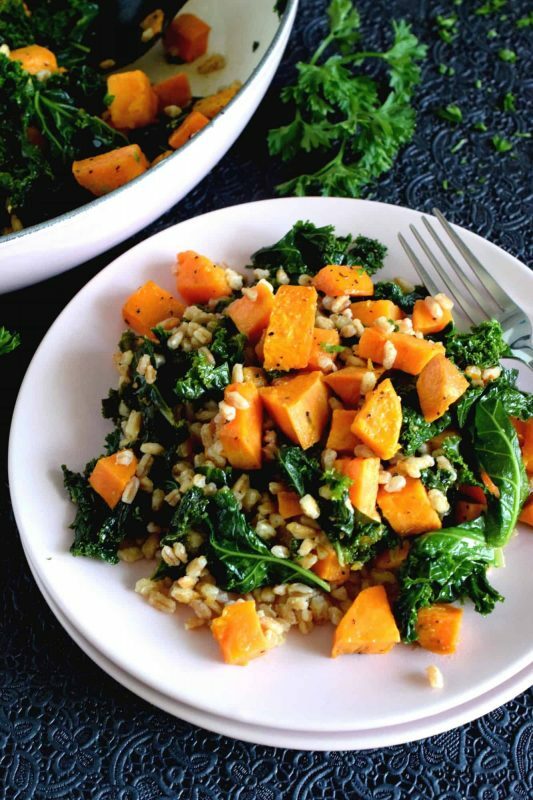 Interestingly, farro and barley can be used interchangeably in most recipes. 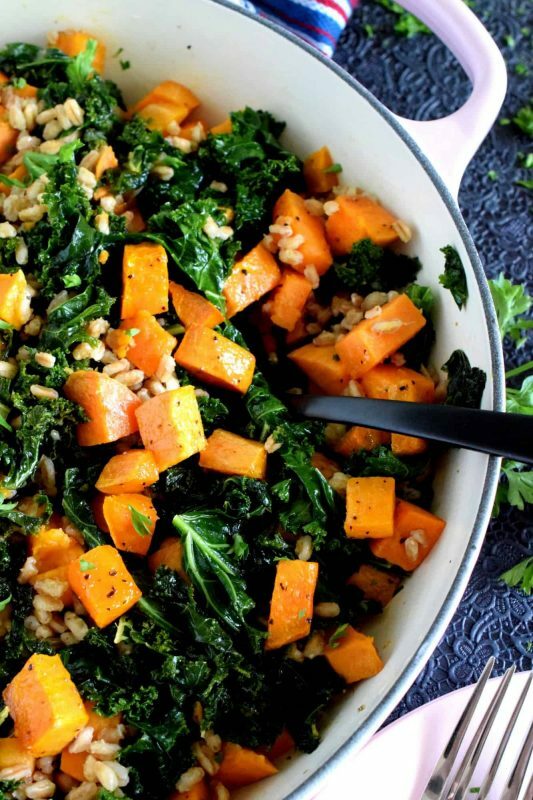 So, if you don’t have farro on hand, but you have barley, then go right ahead and use the barley. 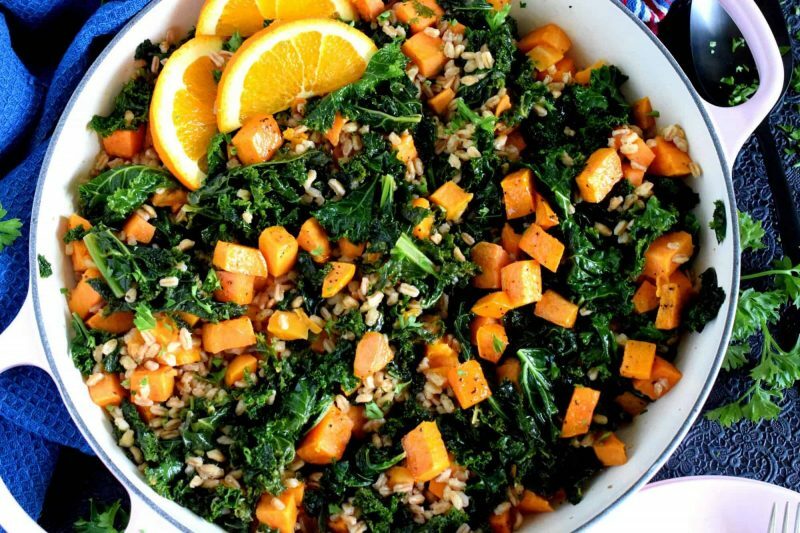 In fact, you can even us a good brown rice in this recipe. What you’ll end up with is a very delicious, protein-packed salad that is warm, hearty, wholesome, and very bright and refreshing at the same time. The fresh ginger will provide the dish with a little heat and a little zing. The orange juice will add freshness and vibrancy. The garlic, of course, is a classic aromatic that is very much so needed when wilting the kale. Overall, this is a salad that eats like a meal. 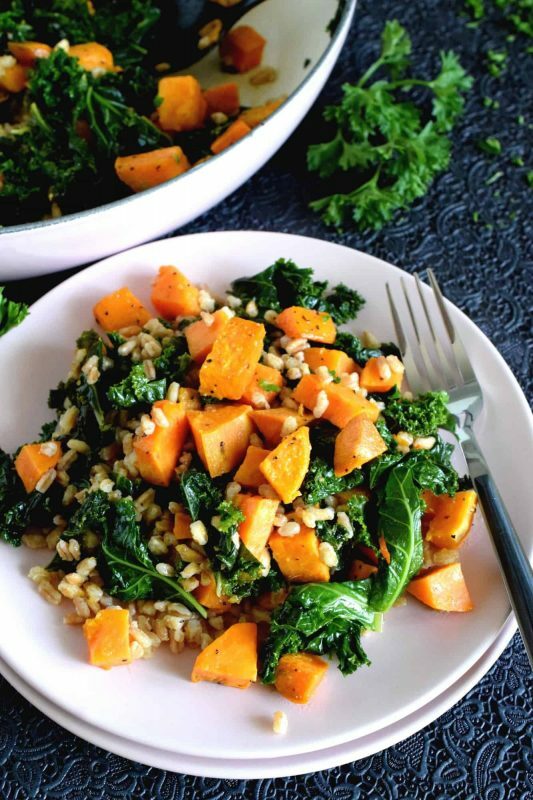 If you would like to use Kale and Sweet Potato Farro Salad as a side, try not to pair it with a main that is robust in flavour. I would serve it with roasted chicken or even a baked pork loin. 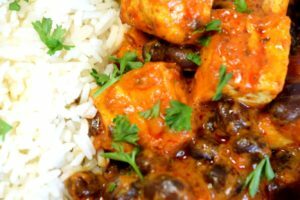 Try to avoid stronger mains like beef or seafood when serving this dish. 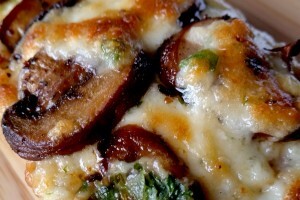 You can also garnish the salad with a little bit of parmesan or feta. 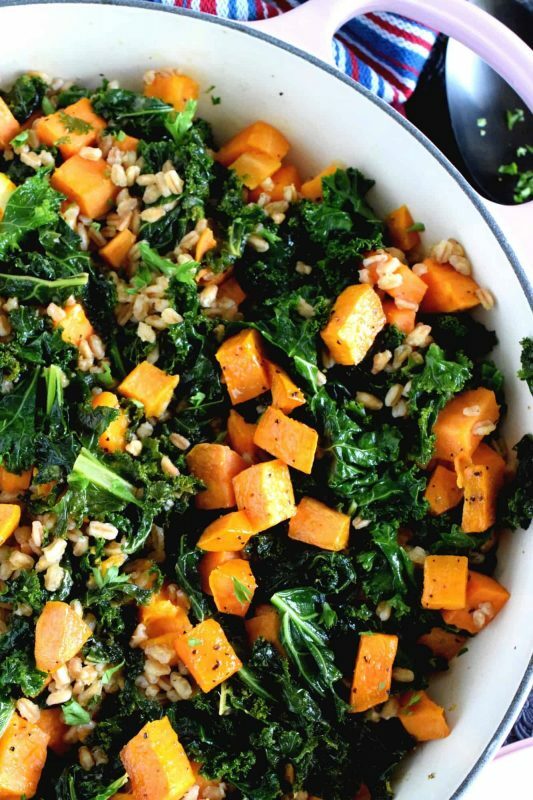 The roasted sweet potatoes and the wilted kale will go quite nicely with the saltiness from either of those cheeses. Enjoy! When summer ends, salads become heartier and more flavourful. 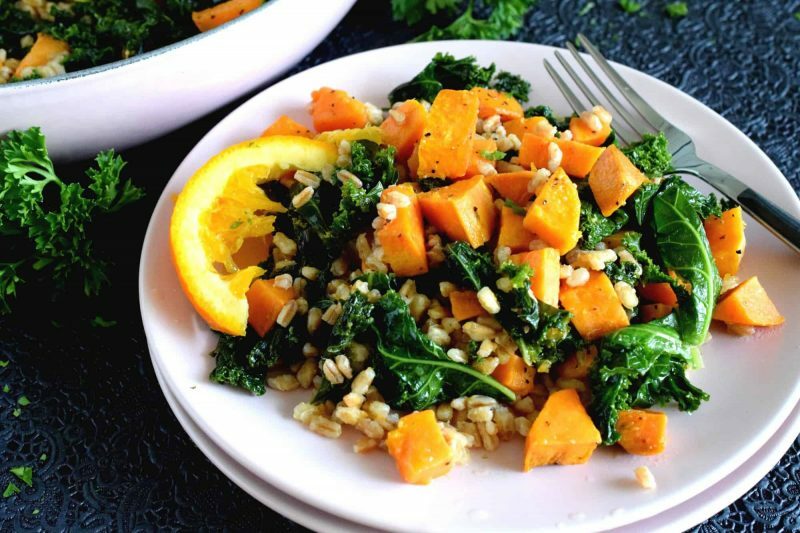 This warm Kale and Sweet Potato Farro Salad is dressed in a light orange and ginger glaze, super high in protein, and delicious too! Add the sweet potatoes, salt, pepper, and one tablespoon of the olive oil to a bowl. Toss to combine. Transfer to a baking sheet. Bake until sweet potatoes are fork-tender - about 20 minutes. 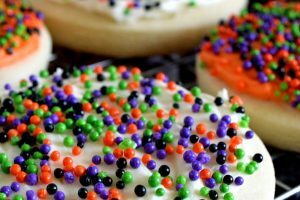 Remove from oven and leave to cool at room temperature. In the meantime, add the remaining olive oil to a skillet, along with the kale. Over medium heat, cook the kale until wilted - about 7 minutes. Add the garlic and ginger to the skillet. 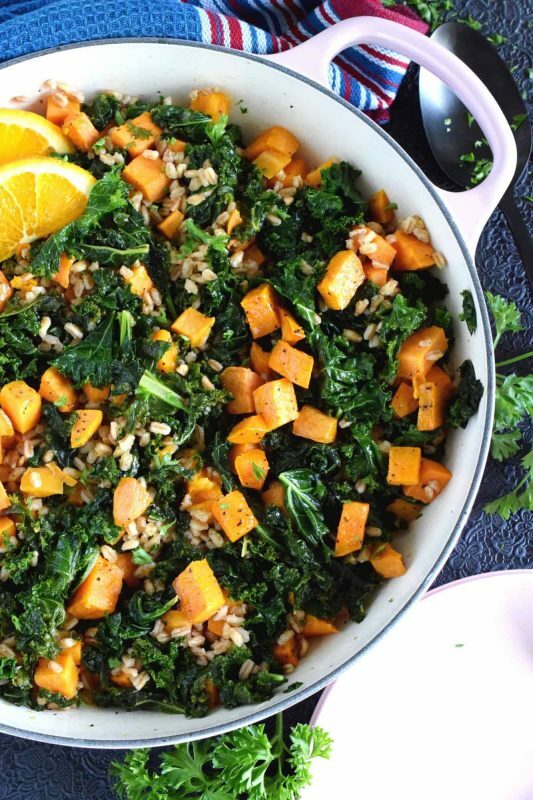 Stir into the kale and cook for 3 minutes. 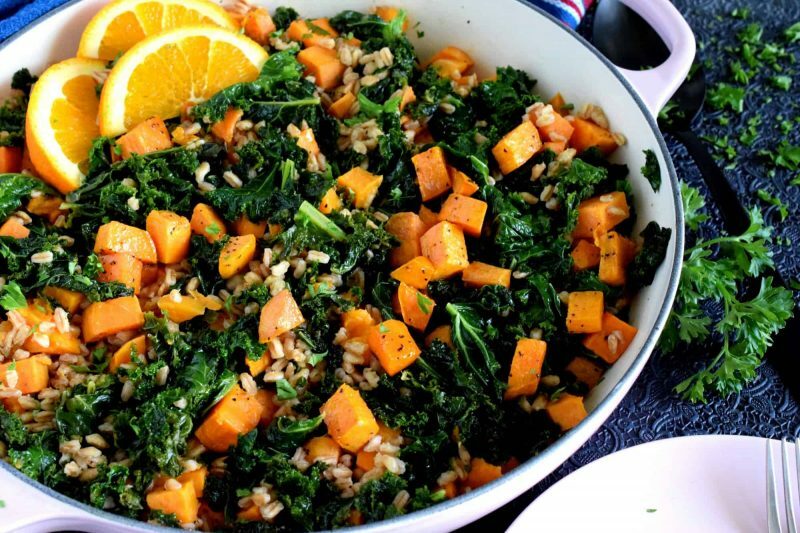 Add the cooked farro to the skillet, along with the roasted sweet potato. Toss to combine. Turn off the heat. 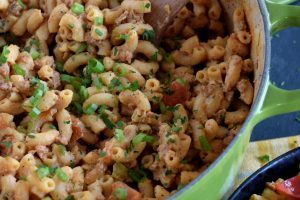 Whisk together the dressing ingredients and pour over the contents of the skillet. Toss to coat and serve immediately.